The aim of the present work is to study the effect of dietary dietary fiber of similar solubility to that of the cooked common bean in the increase of the small intestine, liver, and pancreas of rats. Recently weaned male Wistar rats were fed ad libitum balanced diets containing cooked common bean (12.9% of dietary fiber plus resistant starch) or casein with 5.0% (control group), 10.0%, 12.5% or 15.0% of dietary fiber plus resistant starch added, with the same proportions of insoluble and soluble fibers and resistant starch found in bean (8:3:1) for 14 days. Weight gain and diet intake were smaller in the group fed the cooked bean diet. However, this group showed the highest increase in the studied organs. Rats that ingested the diet containing casein with 15.0% of dietary fiber added showed a growth of 21.4% in the pancreas. Rats fed other casein diets did not show significant differences (p>0.05). The diet containing the cooked common bean led to weight gain of all studied organs (50.0% in the pancreas, 25.0% in the liver and 33.4% in the small intestine) and an increase of 47.1% in the small intestine length. Therefore, dietary fiber plus resistant starch had a trophic effect on digestive organs, although they were not the only stimulation factor, because the cooked bean has other chemical components, like phytates and tannins, that probably contribute to that effect. Key words: Casein, common bean, dietary fiber, digestive organs, rats. Ratas Wistar machos recién destetados fueron alimentados ad libitum con dietas balanceadas, conteniendo frijol común cocinado (12,9% de fibras dietéticas + almidón resistente) o caseína agregado de 5,0% (grupo control), 10,0%, 12,5% o 15,0% de fibras dietéticas + almidón resistente, con las mismas proporciones de fibras insolubles y solubles y almidón resistente, encontradas en el frijol (8:3:1) por 14 días. El aumento de peso y la ingesta de dieta fueron más pequeños en el grupo alimentado con la dieta del frijol cocinado. Sin embargo, este grupo mostró el aumento más alto en los órganos estudiados. Las ratas que ingirieron la dieta conteniendo caseína con agregado de 15,0% de fibra dietética mostraron un crecimiento de 21,4% en el páncreas. Las ratas alimentadas con las otras dietas de caseína no mostraron diferencias significativas (p>0,05). El consumo de dieta conteniendo frijol común cocinado provocó un aumento de peso en todos los órganos estudiados (50,0% en el páncreas, 25,0% en el hígado y 33,4% en el intestino delgado) y un incremento del 47,1% en el tamaño del intestino delgado. La fibra dietética más almidón resistente ejerce un efecto trófico en los órganos digestivos, aunque no fue ese el único factor estimulante. El frijol cocinado puede tener otros componentes químicos, además de los inhibidores de proteasas, lectinas, fitatos y taninos, que probablemente contribuyen a ese efecto. Palabras clave: Caseína, frijol común, fibra dietética, órganos digestivos, ratas. The nutritional value of the common bean is universally acknowledged. Bean contain approximately 60% of carbohydrates, 2/3 of which is starch (18% resistant starch), from 16 to 33% of proteins and a small quantity of lipids, 1 to 3%, most of which is linoleic acid. The common bean has a significant quantity of dietary fiber, minerals such as calcium, iron, phosphorus, potassium, and magnesium and vitamins such as folate, tiamin, and niacin (1-4). It is considered an important source of energy and nutrients, especially for developing countries population (5) and it complements the quality and biological value (percentage of nitrogen absorbed that is retained) of cereal proteins (6). Several studies have shown that the intake of cooked bean has a trophic effect on digestive organs, among which are the small intestine, liver, and pancreas (7,8). However, further research is needed to understand which chemical component of bean is responsible for such effect. Thus, this study aimed at verifying whether diets whose protein source was casein with dietary fiber (cellulose and pectin) and resistant starch (chemically modified) added, in the same proportions found in the common bean, cause an increase in the small intestine weight and length and liver and pancreas weight of rats. The raw common bean (Phaseolus vulgaris L.), cv. IACCarioca ETÉ, with average crude protein value (N x 5.40) of 18.72 + 0.09% was provided by the Grains and Fibers Center of the Campinas Agronomic Institute, SP, Brazil, and the commercial casein, containing 83.34 + 0.64% of crude protein (N x 6.38) was purchased from M. CASSAB Comércio e Indústria Ltda, SP. The common bean and casein crude protein was determined in our laboratory. Bean grains were washed in running water, soaked at room temperature (25oC) for 16 hours, using a 3:1 water:bean proportion. Then they were cooked without discarding the soaking water, using the same water:bean proportion, in a domestic pressure cooker (14.1 psi), for 40 minutes, after the air exhaustion and a constant steam flux flows through the pressure valve. After cooked, grains were frozen, freeze-dried in a Terroni Lyophilizer, model LH 0500 and ground in a Marconi mill, model MA 630, up to 250 μM granulometry. Diets were prepared with only one protein source, cooked bean or casein and they were formulated according to the specifications of the American Institute of Nutrition, diet AIN - 93G (9), except for protein value, which was 12% (10). The dietary fiber values of casein diets were 5.0%, 10.0%, 12.5% e 15.0%, using cellulose (microfine, pharmaceutical degree, Microcel, M. CASSAB Comércio e Indústria Ltda., SP), pectin (Genu type 8140 – Cpkelko) and chemically modified resistant starch (Hi MaizeTM 260, National Starch & Chemical) in the proportion of 8:3:1, respectively. These additions aimed at simulating possible physiological and/or biochemical effects of the dietary fiber fraction and resistant starch present in the common bean in rats. The two types of fiber (pectin and cellulose) were chosen due to the fact that they are the most prevalent in the common bean (5, 11). For control, a diet containing 12% of casein as protein source, with 5.0% of dietary fiber added with similar solubility to that of the common bean was used. The quantities of insoluble and soluble dietary fiber added to the casein diets depended on the quantity present in the common bean and the quantity of resistant starch depended on the value present in the common bean and in corn starch and dextrinized starch. The proportions of dietary fiber and resistant starch added to casein diets were calculated in our laboratory and they are showed on Table 1. All diets were completed to 100% with the carbohydrates, and they became isoprotein (12.0 + 0.2%) and isoenergetic (1551.8 + 22.8 kJ/100g). To calculate the energetic value, 8.4 kJ/g were attributed for soluble fiber and resistant starch due to the formation of short chain fatty acids (12,13). The following components were determined in the cooked bean: moisture (14), ashes (14), crude protein, using the semimicro Kjeldahl method, titanic dioxide as digestion catalyzer (15) and a conversion factor of 5,40 (16); total lipids (17); crude fiber (14), total, soluble and insoluble dietary fiber (18); and resistant starch (19). The carbohydrates value was evaluated by difference. All the analyses were performed at least in triplicate. All the procedures were approved by the Commission of Ethics in Animal Experimentation of the Biology Institute of the Unicamp, Campinas, SP, Brazil (Protocol number 1005-1). Fifty recently weaned (21-23 days) male albine Wistar rats (47.2 + 9.9g) were used. They were provided by the Multidisciplinary Center for Biological Investigation of the State University of Campinas, Campinas, SP, Brazil. The animals were randomly separated in 5 groups and they were maintained on individual growth cages, during all the experiment period, in controlled environment conditions, to keep temperature at 23 + 1oC and 50 to 60% of relative humidity, with a light/dark alternated cycle of 12-hour. Animals had free access to water and diet during all the experiment. The adaptation time was 4 days, during which the experimental diets were already being used. After this period, they weighed 64.3 + 11.3 g. The experiment lasted 10 days and rats’ weight was checked in the morning, on day 5 and on day 10 of the experiment. Diet intake was verified every two days. Rats were killed through cervical dislocation. The liver, pancreas, and small intestine were removed. The small intestine was removed from the pylorus (stomach-duodenum junction) to the ileocecal valve. Length measurement of this organ was performed by means of a measuring tape, holding the small intestine suspended, with a weight of 5.60g hanging from its inferior extremity to guarantee the same tissue stretching. After length measurement, the small intestine was emptied, rinsed with 20 to 30 ml of iced physiologic solution, carefully blotted, and weighed. The liver and pancreas were rinsed with iced physiologic solution, blotted, and weighed on Petri dishes previously weighed. Results were submitted to analysis of variance (ANOVA) and to Tukey’s means test, using the STATISTICA 7.0® software (StatSoft, Tulsa, OK, USA), considering p<0,05 as the minimum acceptable probability for the difference between the means. The centesimal composition of the cooked and lyophilized bean was: moisture (5.10 + 0.13%) and ashes (3.45 + 0.03%). Quantitatively, the bean studied is considered a good source of proteins (N x 5.40) and carbohydrates, since it has 19.03 + 0.03% and 68.36 + 0.37%, respectively; characteristically, bean grains have a small quantity of total lipids (2.80 + 0.06%) and a moderate content of crude fiber (6.36 + 0.40%). The values are expressed on dry basis, in g/100g, and represent the average and the standard deviation of the hexaplicate. The contents of total, insoluble and soluble dietary fiber and resistant starch in the cooked and lyophilized common bean and in the experimental diets are shown on Table 2. The dietary fiber with similar solubility to that found in the common bean additions grew increasingly, from 5.0% (control diet) to 15.0% in the casein diets. The 12.5% value was chosen for being comparable to the common bean diet, which showed 12.9% of dietary fiber plus resistant starch. The ratio insoluble/ soluble fiber showed that there was a prevalence of insoluble fiber, which represented 74% of the total dietary fiber. Average and standard deviation of values (g/100g of body weight) determined at least in triplicate. *CB = Common bean, CBD = Common bean diet, C5.0% = Casein + 5.0 % of dietary fiber plus RS, C10.0% = Casein + 10.0 % of dietary fiber plus RS, C12.5% = Casein + 12.5 % of dietary fiber plus RS, C15.0% = Casein + 15.0 % of dietary fiber plus RS, with similar solubility to that of the common bean. ** Casein + 5.0% of dietary fiber and resistant starch is the control diet. The initial and final weight of the rats, their weight gain and the diet intake after 10 days of experiment can be seen on Table 3. For both weight gain and diet intake, it was observed that rats fed casein diets did not differ among them. However, they differed from the group fed the diet containing the cooked bean as protein source. The lower weight gain of the rats fed the diet containing the common bean can be related to the smaller diet intake. Weight gain increased in all groups during the experiment. Results show that increasing additions of dietary fiber to diets did not alter the animals’ growth rate. Different letters in the same column indicate statistical difference (p<0.05), according to Tukey’s Test. Liver and pancreas weight, small intestine weight and length can be seen on Table 4. Rats fed the diet containing bean showed a considerable increase in pancreas weight (50.0%) in comparison to the control group, and differed from the other groups. Among the groups fed casein diets with dietary fiber plus resistant starch added, only the group whose diet had a 15.0% addition differed from the control group, regarding the pancreas weight, showing a 21.4% increase in the pancreas weight (Table 4). Results suggest a possible pancreas hypertrophy, especially in the rats fed a diet whose protein source was the cooked bean. Casein + 5.0% of dietary fiber and resistant starch is the control diet. The group fed the diet containing bean showed the highest liver weight, differing of the control group, but this group did not differ from the groups whose diets had casein with 10.0%, 12.5% and 15.0% addition of dietary fiber plus resistant starch. These last three groups did not differ from the control group (Table 4). Regarding small intestine weight and length (Table 4), it was observed that only the group fed diet containing bean differed from the control group, showing an increase in the length (47.1%) and weight (33.4%) of that organ. The results for the centesimal composition of the cooked bean are similar to those of Costa et al. (20), Queiroz-Monici et al. (21) and Oliveira et al. (22), when the same cultivar was used. This bean cultivar showed a protein value similar to that found in literature, in which values vary from 16 to 33% (23). Bean grains were cooked using the soaking water to preserve their nutrients. Helbig et al. (24) did not find a significant difference in phytate and tannin contents, considered anti-nutritional factors, in diets containing bean cooked with or without the soaking water. 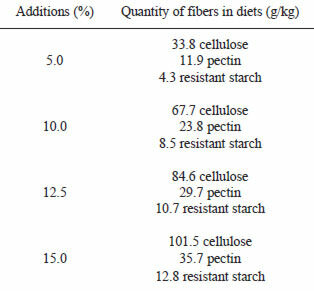 The cooked and lyophilized bean dietary fibers plus resistant starch values and the bean diet dietary fiber plus resistant starch values (Table 2) are in accordance with the values found by Costa et al. (20), Queiroz-Monici et al. (21) and Kutos et al. (25). The entire levels of the cooked bean dietary fiber vary from 11.2 to 27.5% and the resistant starch levels vary from 2.24 to 3.49%, depending on the preparation storage time (26). The bean soluble and insoluble fibers levels vary according to the cultivation method, the grain cultivation conditions, the bean previous treatments, and the analytic determination method. Soluble fiber is more sensitive to such alterations (6, 25). It is well known that gravimetric methods that use thermoestable amylase at 100ºC to eliminate starch leave part of the resistant starch in the insoluble fiber residues. However, we decided not to discount this resistant starch because an exact value for it was not found in the literature. Moreover, there are some authors who do not include resistant starch as dietary fiber; they consider it a substance similar to dietary fiber (27,28). The rats’ weight gain is directly related to their abilities to use nutrients. Therefore, the better is the protein amino acids balance, the better is its use (29). The statistical difference between the group fed the diet containing bean and those groups fed diets containing casein with different additions of dietary fiber plus resistant starch may have occurred due to the fact that the nutritive value of the bean proteins are lower (30,31) and due to cholecystokinin (CCK) secretion, which is associated to satiation both in humans and in animals (32). The weight gain increased linearly in all groups during the experiment, similarly to what was observed by Brunsgaard & Eggum (33). The results of the experiment showed that increasing additions of dietary fiber to diets did not alter the growth rate of the animals, which is similar to what was verified by Pirman et al. (7). Liver and pancreas weight gain may have occurred due to hyper secretion of bile and pancreatic enzymes, respectively, in an attempt to compensate for digestion and absorption inneficiency. For the liver, the alteration in the intestine transit and the pH reduction cause inhibition of 7 a-bacteria dehydroxilation and consequent reduction in the deoxicolic acid production, preventing bile salts from being re-absorbed into the ileo. Moreover that, in comparison to animal proteins, vegetable proteins are less broken by proteases, and they are consequently less absorbed. Therefore, the intensification in liver activity may occur to regulate protein seric levels (34). Ikegami et al. (34) and Corring et al. (35) observed an increase in amylase and proteases secretion and a volume of bile excreted increased when dietary fiber was added to the rats’ diet. Besides dietary fiber and resistant starch, other factors such as the intact protein or peptides presence and the protein type may exert important influence on secretions, provoking the digestive organs adaptation (8,35,36). The small intestine weight gain and the length increase of rats fed the bean diet may have occurred due to an attempt to increase the nutrient absorption area. Moreover, there is an interaction among cooked common bean dietary fiber, resistant starch and other chemical components that have not been identified yet, with the small intestine mucosa, exerting hormonal and mechanical stimulation (37,38). If small intestine weight gain and lengh increase would be confirmed in humans, the cooked bean could be used in Short Bowel Syndrome treatment. Similarly to the findings of this study, other authors have observed a small intestine weight and length increase in rats when dietary fiber was added to the diet. Brunsgaard & Eggum (33) and Brunsgaard et al. (37) observed that its weight and length tripled when 8.0% of dietary fiber and resistant starch were added to rats’ diets after 9 days of experiment. Ikegami et al. (34) found a 55.3% weight gain and a 16.4% length increase of the small intestine in rats fed a diet containing bean for 14 days. Pirman et al. (7) found a 28.2% small intestine weight gain in rats fed diets containing cooked bean for 15 days in comparison to those fed a casein diet. Mccullough et al. (39) observed a 6% weight gain of this organ in rats fed a diet containing 30.0% of a mix of dietary fiber after 14 of experiment (Table 4). The dietary fiber increasing additions to diets containing casein were responsible for the increase of the studied organs measures, although without statistical difference, except for the pancreas. Pirman et al. (7) suggested that dietary fiber seem to be the main factor responsible for the trophic effect of legumes on intestine tissues. The presence of dietary fiber and resistant starch alters the transit and the intestine pH, the intraluminal content viscosity and the digestive enzymes activity, modifying nutrients digestion and absorption (34,40). They can form indigestible complexes with proteins and amino acids, mainly during the heating treatment (8,20,33,41). The heating treatment promotes the formation of high molecular weight protein aggregates, which are hydrolyzed much more slowly by proteolytic enzymes (42). In the casein diets, such complexes were probably not formed in the same proportion, since they did not undergo any heating treatment. Dietary fiber may also exert a direct mechanical stimulation over the intestine mucosa and cause an increase in cell exfoliation (8). The studied organs increase is not a continuous process. It was observed only in the first 9 days after the diet containing fiber introduction and there was no significant difference after that period. In addition, these alterations seem to be permanent (33,37,38). Corring et al. (35) studied the alterations in pancreatic and bile secretions and stated that such alterations are completed in 5 to 7 days after the diet starts. Anti-nutritional factors were not among the stimulator components, because they are heat-labile or show very low residues after the thermal treatment. Lectins and protease inhibitors are inactivated or remained at very low levels, nonharmful, after the thermal treatment (41,43). Helbig et al. (24) found a reduction of 53% in phytates and 89% in tannins when beans were cooked with the soaking water. The diet containing cooked common bean resulted in the studied digestive organs weight gain and in the small intestine length increase. The casein diet, with an addition of 15.0% of dietary fiber plus resistant starch, caused pancreas weight gain. Therefore, dietary fiber plus resistant starch were responsible for the digestive organs increase. However, they were not the only stimulation factor, because the cooked bean has other chemical components, like phytates and tannins, that probably contributed to such effect. Thus, there is a need for further research to know what these other components are. The authors are grateful to CAPES (Coordenação de Aperfeiçoamento de Pessoal de Nível Superior) for the concession of a research scholarship to CORRÊA, TAF; They also thank the Campinas Agronomic Institute, SP, Brazil for providing the pure cultivar of the common bean (Phaseolus vulgaris, L.), the National Starch & Chemical Industrial Ltda, SP for donating of resistant starch, Tovani Benzaquen Representações Ltda, SP for giving the enzymes used in dietary fiber and resistant starch determinations. Rehman Z, Salariya AM, Zafar SI. Effect of processing on available carbohydrate content and starch digestibility of kidney beans (Phaseolus vulgaris L.). Food Chem 2001; 73: 351-355. Messina MJ. Legumes and soybeans: overview of their nutritional profiles and health effects. Am J Clin Nutr 1999; suppl. 70: 439s-50s. Hughes JS. Potential contribution of dry bean dietry fiber to health. Food Tech 1991; 45: 122-26. Uebersax MA, Ruengsakulrach S, Occeña LG. Strategies and procedures for processing dry beans. Food Tech 1991; 45: 104-08. Shiga TM, Lajolo FM, Filisetti TMCC. Cell wall polysaccharides of common beans (Phaseolus vulgaris L.). Ci Tecnol Alim 2003; 23: 141-48. González GCA. Efecto del tratamiento térmico sobre el contenido de fibra dietética total, soluble e insoluble en algunas leguminosas. Arch Latinoam Nutr 2000; 50: 281-85. Pirman T, Combe E, Mirand PP, Stekar J, Oresnik A. Differential effects of cooked common bean (Phaseolus vulgaris) and lentil (Lens esculenta puyensis) feeding on protein and nucleic acid contents in intestines, liver and muscles in rats. Ann Nutr Metab 2004; 48: 281-87. Nascentes RB. Efeito do consumo de leguminosas cozidas (beans-comum (Phaseolus vulgaris, L.) e ervilha (Pisum sativum, L.) no tamanho e atividade celular do intestino delgado e nas secreções digestivas de ratos [dissertação]. Campinas, Faculdade de Engenharia de Alimentos, Universidade Estadual de Campinas 1996. Reeves PG, Nielsen FH, Fahey Jr GC. AIN-93 purified diets for laboratory rodents: final report of the American Institute on Nutrition ad Hoc Writing Committee on the reformulation of the AIN-76A rodent diet. J Nutr 1993; 123: 1939-51. Goena M, Marzo F, Fernández-González L, Tosar A, Frühbeck G, Santidrián S. Effect of the raw legume Vicia ervilia on the muscle and liver protein metabolism in growing rats. Rev Esp Fisiol 1989; 455 Suppl: 55-60. Candela M, Astiasaran I, Bello J. Cooking and warm-holding: effect on general composition and amino acids of kidney beans (Phaseolus vulgaris), chickpeas (Cicer arietinum), and lentils (Lens culinaris). J Agric Food Chem 1997; 45: 4763-67. Salgado SM, Faro ZP, Guerra NB, Livera AVS. Aspectos físicoquímicos e fisiológicos do amido resistente. B Cent Pesq Proc Alim 2005; 23: 109-22. Champ M, Langkilde AM, Brouns F, Kettlitz B, Bail-Collet YL. Advances in dietry fibre characterization. 2. Consumption, chemistry, physiology and measurement of resistant starch; implications for health and food labeling. Nutr Res Rev 2003; 16: 143-61. Association of Official Analytical Chemists. Official Methods of Analysis. 15. ed., Washington, D.C. 1990. Williams PC. The use of titanium dioxide as a catalyst for largescale Kjeldahl determination of the total nitrogen content of cereal grains. J Sci Food Agric 1973; 24: 343-48. Mossé J. Nitrogen to protein conversion factor for ten cereals and six legumes or oilseeds. A reappraisal of its definition and determination. Variation according to species and to seeds protein content. J Agric Food Chem 1990; 38: 18-24. Bligh EG, Dyer WJ. A rapid method of total lipid extraction and purification. Can J Biochem Physiol 1959; 37: 911-17. Asp NG, Johansson CG, Hallmer H, Siljestrom M. Rapid and enzymatic assay of insoluble and soluble dietry fiber. J Agric Food Chem 1983; 31: 476-82. Faisant N, Planchot V, Kozlowski F, Paccouret MP, Colonna P, Champ M. Resistant starch determination adapted to products containing high level of resistant starch. Sci Alim 1995; 15: 83-89. Costa GEA, Queiroz-Monici KS, Reis SMPM, Oliveira AC. Chemical composition, dietary fibre and resistant starch contents of raw and cooked pea, common bean, chickpea and lentil legumes. Food Chem 2006; 94: 327-30. Queiroz-Monici KS, Costa GEA, Silva N, Reis SMPM, Oliveira AC. Bifidogenic effect of dietary fiber and resistant starch from leguminous on the intestinal microbiota of rats. Nutr 2005; 21: 602-08. Oliveira AC, Nery ACC, Jackix EA, Santos EF, Carvalho IR, Correa TAF et al. 2005. O cultivar de feijão-comum (Phaseolus vulgaris,L.) IAC-Carioca-Eté apresentou elevada biodisponibilidade de metionina. In: Simpósio Latino Americano de Ciências de Alimentos, Campinas, São Paulo, Brasil. Universidade Estadual de Campinas 2005. Chiaradia ACN, Costa NMB, Gomes JC. Retirada do tegumento e da extração dos pigmentos na qualidade protéica do feijãopreto. Rev Nutr 1999; 12: 131-36. Helbig E, Oliveira AC, Queiroz KS, Reis SMPM. Effect of soaking prior to cooking on the levels of phytate and tannin of the Common Bean (Phaseolus vulgaris, L.) and the protein value. J Nutr Sci Vitaminol 2003; 49: 81-86. Kutos T, Golob T, Kac M, Plestenjak A. Dietary fibre content of dry and processed beans. Food Chem 2003; 80: 231-35. Osorio-Díaz P, Agama-Acevedo E, Carmona-Garcia R, Tovar J, Paredes-López O, Bello-Pérez L. A. Resistant starch and in vitro starch digestibility of cooked “ayocote” bean (Phaseolus coccineous). Interciencia 2004; 29: 510-15. Roberfroid MB. Dietary fiber, inulin and oligofructose: a review comparing their physiological effects. Crit Rev Food Sci Nutr 1993; 33: 103-48. Saura-Calixto F, García-Alonso A. Metodología para el análisis de fibra y carbohidratos. In: Lajolo FM, Saura-Calixto F, Penna EW, Menezes EW, editores. Fibra Dietética en Iberoamérica: tecnologia y salud. São Paulo: Varela; 2001. p. 15-25. Onyeike EN, Ayalogu EO, Uzogara SG. Influence of the heat processing of African yam bean seed (Sphenostylis stenocarpa) flour on the growth and organ weights of rats. Plant Foods Hum Nutr 1995; 48: 85-93. Rubio LA, Grant G, Daguid T, Brown D, Pusztai A. Organs relative weight and plasma amino acid concentrations in rats fed diets based on whole legume (faba bean, lupin, chickpea, defatted soybean) seed meals or their fractions. J Sci Food Agric 1999; 79: 187-94. Lanfer Marquez UML, Lajolo FM. In vivo digestibility of bean (Phaseolus vulgaris L.) proteins: the role of endogenous protein. J Agric Food Chem 1991; 39: 1211-15. Bourdon I., Olson B, Backus R, Richter BD, Davis PA, Schneeman BO. Beans, as a source of dietary fiber, increase cholecystokinin and apolipoprotein B48 response to test meals in men. J Nutr 2001; 131: 1485-90. Brunsgaard G, Eggum BO. Small intestine tissue structure and proliferation as influenced by adaptation period and indigestible polysaccharides. Comp Bioch Physiol 1995; 112A: 365-77. Ikegami S, Tsuchihashi F, Harada H, Tsuchihashi N, Nishide E, Innami S. Effect of viscous indigestible polysaccharides on pancreatic biliary secretion and digestive organs in rats. J Nutr 1990; 120: 353-60. Corring T, Juste C, Lhoste EF. Nutritional regulations of pancreatic and biliary secretions. Nutr Res Rev 1989; 2: 161-80. Ide T, Horii M. Predominant conjugation with glycine of biliary and lumen bile acids in rat fed on pectin. Br J Nutr 1989; 61: 545-57. Brunsgaard G, Eggum BO, Sandström B. Gastrointestinal growth in rats as influenced by indigestible polysaccharides and adaption period. Comp Biochem Physiol 1995; 111A: 369-77. Yang Y, Joern A. Gut size changes in relation to variable food quality and body size in grasshoppers. Funct Ecol 1994; 8: 36-45. Mccullough JS, Ratcliffe B, Mandir N, Carr KE, Goodlad RA. Dietry fibre and intestinal microflora: effects on intestinal morphometry and crypt branching. Gut 1998; 42: 799-806. Mcdonald DE, Pethick DW, Mullan BP, Hampson DJ. Increasing viscosity of the intestinal contents alters small intestinal structure and intestinal growth, and stimulates proliferation of enterotoxigenic Escherichia coli in newly-weaned pigs. Br J Nutr 2001; 86: 487-98. Carbonaro M, Grant G, Cappelloni M, Pusztai A. Perspectives into factors limiting in vivo digestion of legume protein: antinutritional compounds or storage proteins?. J Agric Food Chem 2000; 48: 742-49. Lanfer Marquez UM, Lajolo FM. Nutritional value of cooked beans (Phaseolus vulgaris) and their isolated major protein fractions. J Sci Food Agric 1990; 53: 235-42. Kadam SS, Smithard RR, Eyre MD, Armstrong DG. Effects of heat treatments of antinutritional factors and quality of proteins in winged bean. J Sci Food Agric 2006; 39: 267-75.